Memoranda + May 21st - While in chamber first of P.M. 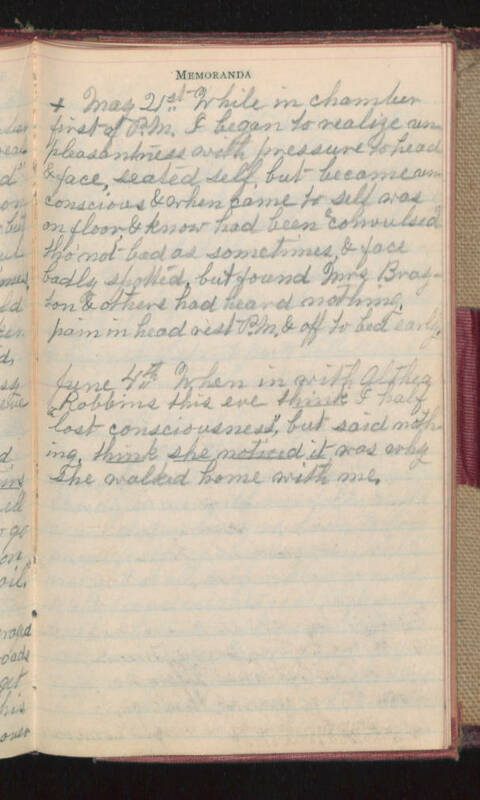 I began to realize unpleasantness with pressure to head & face, seated self, but became unconscious & when came to self was on floor & know had been "convulsed" tho' not bad as sometimes, & face badly spotted, but found Mrs Brayton & others had heard nothing. Pain in head rest P.M. & off to bed early. June 4th - When in with Althea Robbins this eve think I half "lost consciousness", but said nothing, think she noticed it was why she walked home with me.